Unity College received a B+. Washington Monthly's ranking of 30 out of 346 of Baccalaureate Colleges - Overall Rank was a major contributor to this grade. Unity College, located about 60 miles from Bangor, ME, is a specialized institution educating its 500 undergraduate students in the environmental sciences, outdoor recreation, and resource protection and management. Unity College has its own wetlands research reserve, and something called the Wood Duck Club. What are the top 3 reasons someone should attend Unity College? Lots of hands on classes. Teachers with extensive background in all majors (ie zoo keeper, wildlife biologist). It's a small school where students are close to one another. What is a typical Unity College student like? Describe the type of person that should attend Unity College. Students that have a strong passion for the environment, whether focusing in law, working outdoors, or working with wildlife. Students all share a love of the environment and wish to protect it in some manner. Here at Unity College, we're leaders in the environmental movement, focused on sustainability in the classroom and in the real world. Our friendly campus community is full of active learners--both students and teachers--who collaborate in creating adventures that help you grow personally and professionally. Unity's dedicated faculty members publish in peer-reviewed journals, administer immersion semesters at Outward Bound School, testify at state legislative committee hearings on utilities and energy, collaborate with students on research presented at national conferences, develop team-teaching programs, create demonstrations of on-campus renewable energy options, restructure the organic chemistry labs to reduce toxic waste, and direct an environmental writing retreat that attracts participants from across the country. Unity is a college for contemporary times. Founded in 1965, we've been around long enough to know what we're doing while we focus on contemporary issues and the future of the planet. 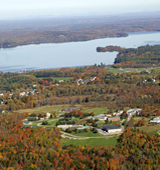 We're located on 225 wooded acres of farmland overlooking Unity Pond in the village of Unity, Maine, home to 1,800 friendly folks. Just over 500 eclectic, adventuresome students study here with nearly 60 dedicated, professional, outdoor-loving faculty members. And the whole state of Maine serves as our hands-on learning laboratory. At Unity College, you learn by doing, through active and collaborative adventures that balance theory and practice. You can live your passion and make a difference in others' lives and in the natural world. And you'll develop your leadership skills in a welcoming, friendly community. We know you'll like it here. What are the top 3 things that students do for fun at Unity College? Have a fire at the fire pit with late night snacks and games Go to the Unity Center of Performing Arts for our monthly movie. Go to performances at the Student Activities Center. Campus housing is available for undergraduates. Housing deposit : $100.00. Housing deposit due : Apr 1. Housing deposit is not refunded if student does not enroll.. Freshman allowed to have car. No pets. 55% of students live on-campus. 88% of freshman live on-campus. A program that prepares individuals to plan, organize, and direct recreational activities designed to promote health and well-being for patients who are physically, mentally, or emotionally disabled. Includes instruction in the foundations of therapeutic recreation, leisure education and counseling, program planning, therapeutic recreational modalities, basic anatomy and physiology, psychology, medical terminology, human growth and development, patient observation and evaluation, special needs populations, and professional standards and ethics. A program that prepares individuals to work as an educator, instructor or facilitator in parks, recreational facilities, camps and other outdoor settings. Includes instruction in leadership skills, wilderness survival skills, first aid, group processes, counseling techniques, environmental studies and instruction in recreational activities such as rock climbing, ropes courses, backpacking, kayaking and canoeing. Any instructional program in natural resources conservation and research not listed above. A program that prepares individuals to enforce natural resource and environmental protection regulations and laws; and to perform emergency duties to protect human life, property and natural resources, including fire prevention and control measures, and emergency and rescue procedures. Includes instruction in natural and physical sciences, natural resource management, outdoor field skills, firearms and outdoor equipment and vehicle operation, evidence collection and environmental sampling and monitoring, natural resource legislation, environmental compliance techniques, patrol procedures, investigation and report writing, interpersonal skills and crisis intervention, community liaison, public safety, public education, and public relations. Note: this program was re-instated after being deleted from CIP 2000; previously, it was coded as 03.0203. Monitor recreational areas, such as pools, beaches, or ski slopes to provide assistance and protection to participants. A program that focuses on domesticated plants and plant materials used for decorative and recreational applications and prepares individuals to breed, grow, and utilize ornamental plant varieties for commercial and aesthetic purposes. Includes instruction in applicable plant science subjects, the environmental design and artistic aspects of horticultural product usage, and the management of horticultural operations. A program that prepares individuals to manage and maintain indoor and/or outdoor ornamental and recreational plants and groundcovers and related conceptual designs established by landscape architects, interior designers, enterprise owners or managers, and individual clients. Includes instruction in applicable principles of horticulture, gardening, plant and soil irrigation and nutrition, turf maintenance, plant maintenance, equipment operation and maintenance, personnel supervision, and purchasing. Mix or apply pesticides, herbicides, fungicides, or insecticides through sprays, dusts, vapors, soil incorporation, or chemical application on trees, shrubs, lawns, or botanical crops. Usually requires specific training and State or Federal certification. 55% of students graduated in the top half of their class. 33% of students graduated in the top quarter of their class. The average student pays $22,516 for tuition, fees, and other expenses, after grants and scholarships. Total stated tuition is $23,900, in-state and on-campus, before financial aid. Learn more about financial aid at http://www.unity.edu/admissions/financial_aid. Estimate the net price for you at http://tcc.noellevitz.com/(s(rrtdkelt34luo2ssc4uqtdk5))/unity%20college/freshman%20students. 77% of full time students continued studying at this school after freshman year. Want more info about Unity College? Get free advice from education experts and Noodle community members.